What are the differences between being frugal and cheap? Many people use the two phrases interchangeably and I just don't get it. Some people believe that frugal is the polite way of saying that someone is cheap. Calling someone cheap can be seen as offensive while being called frugal can often be viewed as a compliment. Why is that? While there is a fine line between being frugal and cheap, there are some major differences to be mindful of. Knowing these differences can change your entire outlook on frugality and equipt you with some valid points to share with all the naysayers. The word cheap is defined as costing very little; relatively low in price; inexpensive. For as long as I can remember, ‘cheap' has also been used to suggest inferiority and low value, like a ‘cheap piece of furniture' for example. As you can probably tell by each definition, the word cheap is solely based on price while frugal isn't. When someone is cheap, they aim to save money at all costs – even at the expense of others sometimes. Some of you might remember the show called Extreme Cheapskates. It featured everyday people who were extremely cheap and it stung a little to see how their families and friends were being affected by their lifestyle. It also completely stressed me out, ha! There was one episode that really stuck out to me. A mother was planning her daughter's wedding and she cut corners to the point where she booked the wedding in a high school gym, purchased decorations at the dollar store, and had her daughter buy her wedding dress at a thrift store. Now, if her daughter were truly pleased with how her wedding was planned, I would be okay with it but clearly, she wasn't and it was sad to watch. A wedding is a once-in-a-lifetime event and while you don't have to spend $40,000 on just one day, a frugal person would be okay with keeping expenses manageable and spending money on what they valued. For example, a frugal wedding could take place in a family member's backyard or the family's church. Friends and relatives could help make flower arrangements, bouquets, and flowers. If the couple isn't crazy about alcohol, they could tell guests to BYOB and have a cash bar. If the couple values sharing a meal with their loved ones and celebrating their big day with lots of dancing, they may find a referral for a caterer and DJ. See the difference? Which wedding would you want to attend? When it comes to frugality, it's important to use your values as your bottom line and be okay with spending on what's important you. When you're cheap, you just focus solely on spending as little money as possible, no matter who it affects. 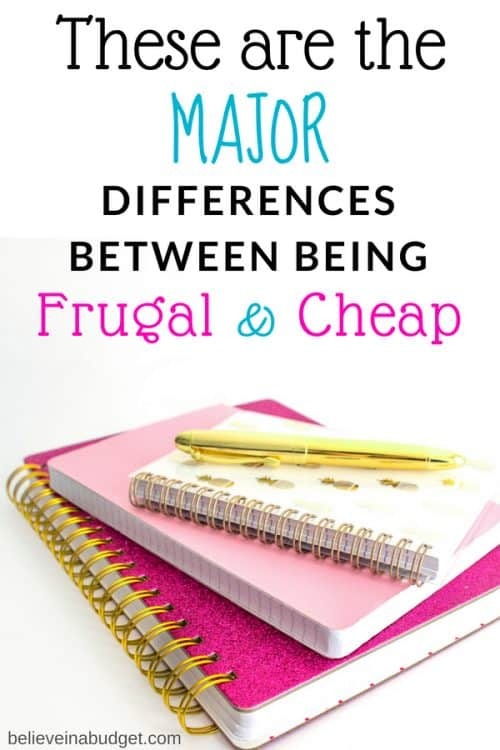 One of the other major differences between being frugal and cheap is that frugality allows you to utilize all your resources regardless of the cost. Don't get me wrong, frugal people are interested in saving money, but they are willing to research and make the most of what they have before settling for the easy way out and spending as much money as possible. For example, a cheap person may buy the most inexpensive pair of jeans to save money. A frugal person might go for the better quality jeans but use a coupon or purchase them during a sale to make the purchase more affordable. If a good friend is getting married and having a destination wedding, a cheap person might decline if they don't want to pay for the trip while a frugal friend might look for discounts or use credit card miles to help pay for their flight so they can attend. Finally, I wanted to use a food example because people love to call others cheap when they don't want to dine out and splurge on meals. Both frugal and cheap people like to save money on costly expenses like food. But a cheap person is likely to purchase whatever cost the least (even if it isn't the healthiest choice), while a frugal person might set a budget and invest in nutritious and whole foods. When you focus on always spending as little as possible, you end up doing yourself a major disservice especially in terms of your time. Time is an invaluable resource that none of us can get back. When you're cheap and don't want to pay for products and services that can help you gain back your time, you can end up being overworked and stressed out. If I were cheap and didn't want to invest in hiring a small team to help with my business, I would have a horrible work-life balance right about now. Being able to see the value in hiring an assistant along with experts in certain areas of my business allows me to free up more of my time to do the things I love and be present with friends and loved ones. I've expressed how important it is to have a budget before. Using a budget can really help you get ahead financially and meet all your money goals. There is a right and a wrong way to budget though. Since cheap people focus mainly on price, they hardly budget with a purpose and may just attempt to spend less on every monthly expense that hits their account. A budget should actually be based on a few key factors like your lifestyle, income, and financial goals. You also want your budget to be realistic which is key. Is it realistic to spend very little money on everything all the time? Probably not because it's not sustainable. A better solution would be to get clear on your values and to prioritize your spending so you can save money and spend intentionally on what's important. As you can see, there are some major key differences between being frugal and cheap. I choose to be frugal but if people call me cheap I just brush it off. When you don't understand the true meaning of being frugal or being cheap, it's very easy to mix the two phrases up but only one will allow you to improve your finances. Do you think there are differences between being cheap and frugal? Wow, I don’t know what I would have had your grace in that situation. I might easily have pointed out that lying about satisfaction to avoid paying a tip is literally the cheapest thing I’ve ever heard of. I’m actually not exaggerating on that one. It’s the worst one that I can remember hearing. It was really, really hard to bite my tongue. She was truly awful!